Digital pressure gauges offer distinct advantages over other pressure gauge varieties, chief among which is the easiness with which they can be read accurately. Two people reading the same analogue pressure gauge can produce two different readings due to imprecision of markings or other factors. Digital pressure gauges eliminate this problem, indicating pressures with numbers as opposed to ambiguously positioned needles. They can also be read more quickly, which in emergency situations can mean the difference between crisis aversion and equipment failure. Those main differences aside, digital pressure gauges are similar to analogue configurations in terms of their mechanical components and basic operating principles. All pressure gauges measure the concentration of fluids in a given area. In the case of balloon helium, for example, a pressure gauge is placed near the valve to indicate the quantity of helium in the enclosure; pressure is an expression of a fluid’s concentration. Digital pressure gauges can be used to measure highly pressurized fluids as well as low pressure concentrations. They can be used to measure concentrations of water, oil and all kinds of gases. Digital readouts are typically small liquid crystal numeric displays that operate on battery power. 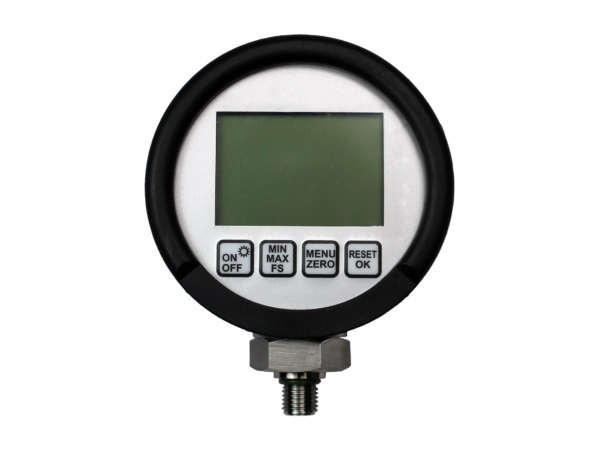 When a digital pressure gauge is connected to an enclosure in which pressurized fluids are contained, the equipment within the gauge senses the pressure level and expresses it numerically on a display. The display can often feature accurate readings to one or more decimal points; analogue gauge needles can point between numbers, but a person reading an analogue gauge would have to guess at decimal values. Like all other gauge varieties, digital pressure gauges vary in terms of their configurations and applications. There are many ways in which fluid pressure is measured, and digital pressure gauges can be applied in each of them. For example, gauge pressure, which is pressure measured relative to ambient atmospheric pressure, is often measured with digital pressure gauges. They can also be used to measure absolute pressure, which is fluid pressure measured independent of the influence of ambient atmospheric pressure. The only main drawbacks that limit the effectiveness of digital pressure gauges is the difficulty of reading some models in excessive or inadequate light and the necessity to periodically change batteries. Digital Pressure Gauge Digital pressure gauges are instruments used to measure fluid pressure in an area; they are distinct from analogue gauges in that their readings are represented on a digital display for easy, quick reading.